Traditional Tudor Manor family room gets a fresh look! This traditional Tudor Manor is updated with a muted palette of creams, taupes and greys to create an atmosphere that is warm and inviting. The muted tones are present in the new teak floors, custom cabinets and new furniture to make a multifunctional back drop for entertaining family and friends in the open floor plan for the kitchen and family room. The ceiling was raised to capture the vaulted lines of the roof. New recessed LED fixtures provide spot and flood lighting. The family room is transformed with new teak flooring, cabinets, furniture and a new fireplace façade. 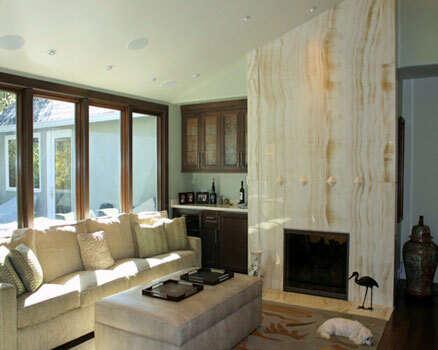 The traditional fireplace mantel was replaced with floor to ceiling onyx slabs on the wall and hearth to create a dramatic focal point. To the left of the fireplace is a dry bar with an undercounter refrigerator. The new sofa is upholstered in a chenille fabric. The storage ottoman is upholstered in leather and accented with trays for drinks. The custom rug has the muted, greys, greens and caramel hues in an abstracts pattern. The transition between the family room and kitchen is a pair of swivel chairs upholstered in a green chenille, with a ceramic drum table. The attention to detail in every aspect of this remodel has resulted in a timeless design that is functional for family gatherings or entertaining a group of friends.